Another normal Sunday swimming gala for Halstead Swimming Club. Well I don't think so…. OMG where did that come from everyone. Massive effort by all and PB going on all over the place. Ruby Weaver and Charlotte Nicholls in the 50m breaststroke and Lewis Wilson with a massive PB in 200m breaststroke and 100m freestyle. Franklin Farren what a PB in your 100m freestyle. You made your mum cry so hard. Matt Bale what a great race and a massive PB in your 200m breaststroke, you gave it all and Thomas Nicholls getting a PB in 100m freestyle and Thomas Bale breaking 1:01 for 100m freestyle. Apologies, i missed the boys 50m freestyle with all getting PB’s and Jack Weaver with a PB, you most definitely giving it all see missing the 100m freestyle helped. Remember to sign in Jack J. Another great effort by all and PB’s for Ruby Weaver 3:30 and Jasmine Bale 2:52 in the 200m IM. Phoebe Hale just missing out but great effort. b for Phoebe, Ruby and Emily kay in 50m backstroke but Rose Vinter and Sophie Tyrie just missing out, but you both just keep on smiling after each race which is lovely to see. Oliver Tyrie PB’d in 100m IM, just imagine if you were there with a couple of minutes to get ready but great effort don’t change. Only one girl in 200m freestyle and yes she did it Paddy, 02:55 Emily Kay, you made me feel so proud. Sophie, what a great effort in your 100m backstroke brilliant first (50m think it was PB) and you worked hard right to the end. Well done Phoebe on your 100m just outside a PB. Great effort for Lewis and Matt on the last event 100m you both work hard. Thanks to Julian ‘sign me in Weaver’, Mike Nicholls and Matt Bale for making sure the swimmers got to the right place, and all the parents for making it a great weekend! Now it time for me to find my voice…. see you all tomorrow thank you…. Basildon open meet. 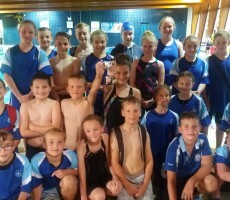 A group of swimmers travelled to Basildon today to compete in the above meet. To say they were outstanding is an understatement. Eloise Conway, having been at the club for 10 years plus provided a fabulous 100 free PB which had eluded her for a couple of years. This set her up for 2 very good fly and IM swims. In the 400 free Ethan Howard, Lewis Wilson, Thomas Nicholls, Franklin Farren and Thomas Bale smashed their PB ‘s by a considerable margin. Matt bale, the oldest swimmer there improves with every swim and at the other end of the scale our 9 year olds Phoebe Hale, Emi Rayner and Rosie Candler, gained valuable experience with again Emi medalling in her events. Charlotte Nicholls is becoming a very solid performer and her consistency is the key having performed well on all events. Jasmine Bale is becoming a very strong athlete and evidence of this came in her 200 Breaststroke with a great PB. Ruby Weaver is quietly coming along nicely and is always reliable with 1 or 2 PB’s, as is brother Jack who is starting to realise his potential. (not sure "quietly" was apt when talking about the Weaver clan) Evie Williams having recently come back to the sport after 2 years out is not far away from becoming a good sprinter by posting some very good PB’s from all swims. One of the most pleasing of swims came from Rose Vinter. Rose has had a tough couple of years when it didn't seem to happen for her and then with a bang she obliterated her 100 free swim. The confidence will now grow hopefully for further improvement. Possibly the best performances came from Chloe and Ella Linney. 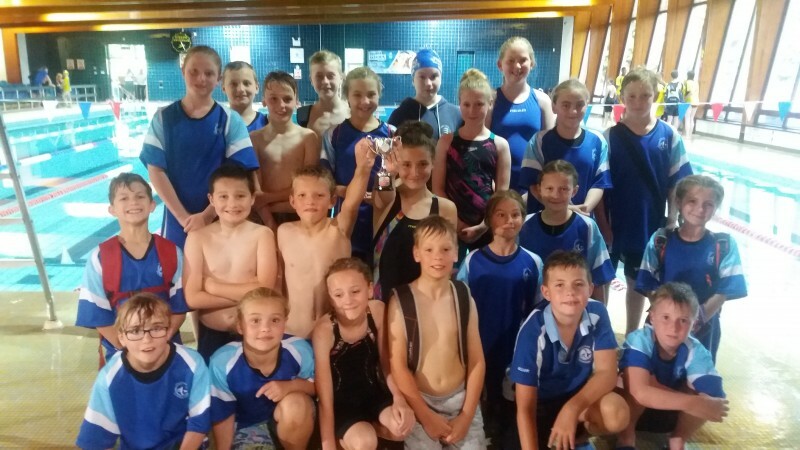 Their improvement has shot them several places forward in their age groups with excellent free and fly swims. Emily Kay smashed her 50 free even with an injured foot and there is more to come. Sophie has the potential to become one of the leading swimmers at Halstead and although she has recently not performed to her best she came up trumps today with a PB free swim showing the aggression that had been missing. Brother Oliver is suddenly putting in performances that a little while ago were nowhere near, he is growing up and getting stronger and his fly swim was magnificent. Isabella Lewis is getting to grips with a new action on her Breaststroke and it seems to be paying dividends. Jack Smith was a finger nail away from breaking the club 100 back record but consoled himself with a gold medal; next time Jack. My favourite swim came from Thomas Bale in the 200 free by turning out very even split times to smash his time by over 6 seconds. Again the support we received from our parents was superb and i know the swimmers appreciate it; bring on Sunday. The National Junior League team sheet is now in the notice board. I know i said the same a year ago but we have since had new members and i would like to reiterate what i said. The Junior league is the most prestigious junior competition in the Country, It is Nationwide culminating in a grand final We are affiliated to the London Region and whilst we are a long way off from being with the elite we are improving each year. The competition lends itself to making sure we have the strongest team possible available for each round. There are 3 rounds, April, May, June. I would ask, as we are a relatively small club for all swimmers to make themselves available for selection. This is the sort of competition where Grandparents, aunts, uncles and the rest of the family would be highly entertained by their siblings in a friendly but competitive gala. Because of our size any dropouts have a huge effect on our ability to be placed higher up in the league so i would ask for everyone to be available. Often the biggest obstacle is being able to get to the gala but if there are any problems please let myself or any official know and we can sort out lifts. Each year i find myself getting a little more excited by the prospect of Halstead progressing, and we are half way in from a 5 year turnaround with our juniors to not only do well but also progress to the senior teams. Enough said, i'm rambling now, but please put a tick by your name. Many Thanks JOHN. Mini League. Halstead S.C. had their first Essex Mini league gala for several years at Saffron Walden tonight. A good performance saw us finish in 3rd place on the night. Most pleasing were the number of newbies having their first competition and their performances were outstanding and will do their confidence no harm at all. So to Eva, Katie, Lewis, Olivia, Phoebe, Edward, Mary, well done. Some excellent swims from some of the more established came from Ethan, Daniel, Ellis, Emily, Rosy B, William, Oliver, George, and brother and sister Erin and Jack. The young age groups certainly look good for the upcoming Junior league. Well done. Excellent performance at the County Champs!